Most stellar remnants so far have been found in binary systems, where they interact with matter from their companions. Isolated neutron stars and black holes are difficult to find as they are dark, yet they are predicted to exist in our Galaxy in vast numbers. We explored the lightcurves of 150 million objects observed in years 2001-2009 during the OGLE-III project, covering total of 31 sq.deg. towards the Galactic bulge. In our previous work (Wyrzykowski et al. 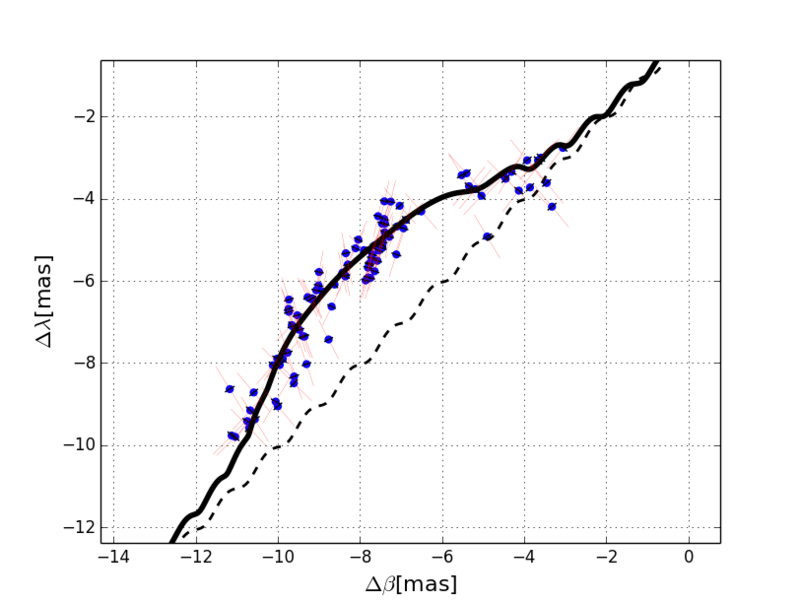 2015), in this dataset we have selected 3500 standard microlensing events suitable for studies of the Galactic bulge structure. Here, we searched for non-standard events exhibiting clear and strong parallax effect due to the Earth's motion around the Sun. Such events allow for constraining the mass and distance to the lens much better than standard events, but are more rare. We found 59 high quality parallax microlensing events. 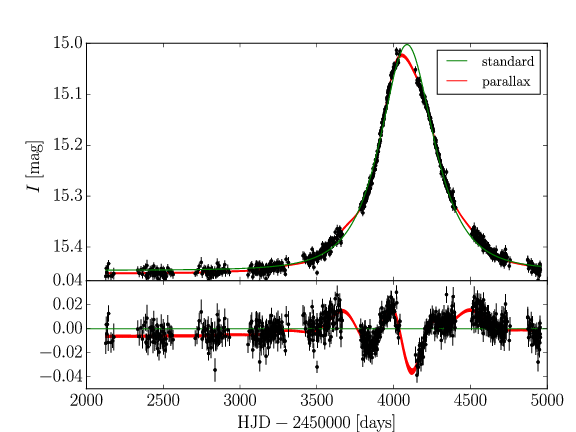 The OGLE I-band light curve of the multi-peak parallax microlensing event, OGLE3-ULENS-PAR-01. This is the longest lasting event ever found with its length (time with microlensing amplification 1σ above the baseline) of 2840 days. The best-fitted Einstein ring crossing time, tE=264 days. The lens here is a possible nearby white dwarf, but both main sequence star or neutron star can not be excluded. Combining parallax and brightness measurements from microlensing light curves with expected proper motions in the Milky Way, we identified 13 microlensing events which are consistent with having a dark lens, i.e., white dwarf, neutron star or a black hole lens and we estimated their masses and distances. The most massive of our black hole candidates, OGLE3-ULENS-PAR-02 has 9.3 M☉ and is at a distance of 2.4 kpc. The most massive lens candidate from our sample, OGLE3-ULENS-PAR-02. Left shows OGLE I-band light curve with the best parallax model. 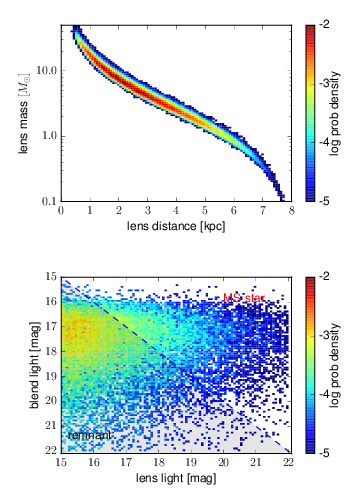 Right top shows probability density for mass and distance of the lens. 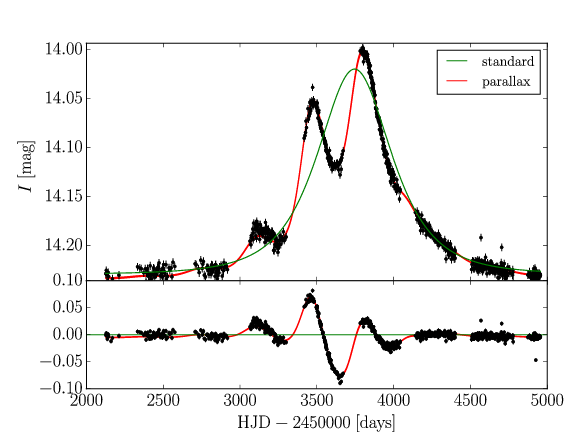 Right bottom shows probability distribution for blend brightness and lens brigthness for given mass and distance if the lens was a main sequence star. The integrated probability that PAR-02 is a dark remnant is above 99%. For each of our dark remnant candidate we obtained a marginalised probability distribution function for its mass, shown here in red. The blue lines indicate their medians and the histogram below is for the median mass of each lens. 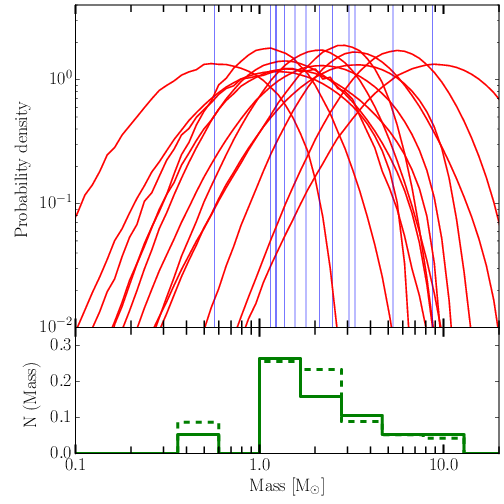 The dashed line is the median mass histogram corrected for the detection efficiency of our search. The distribution of masses of remnants indicate lack of mass gap between neutron stars and black holes, however, our mass functions are still too wide to be completely conclusive. In order to derive more accurate masses of stellar remnants via microlensing, the ground-based photometry with parallax signal has to be complemented with astrometric measurements of centroid shift during the microlensing event. This will be possible for the first time with the ESA's Gaia mission, operating since 2014. 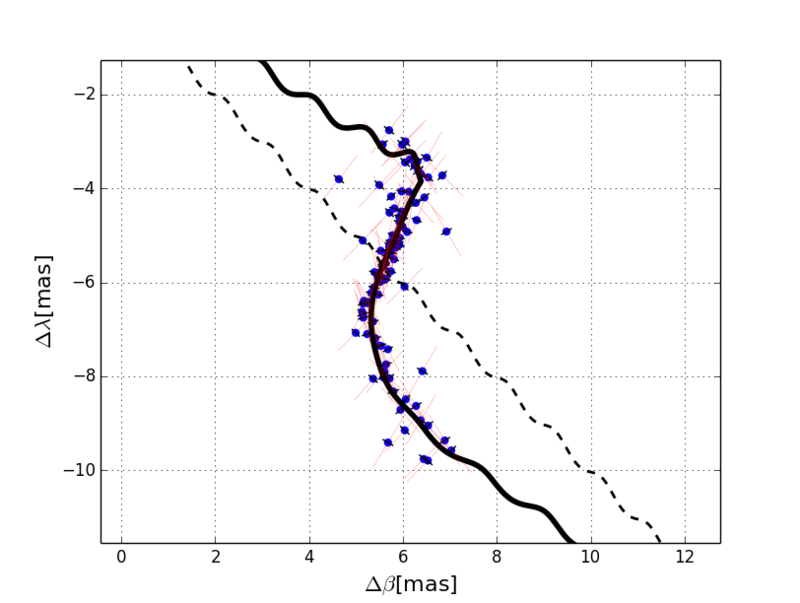 The figures show simulated astrometric measurements for a black hole lens similar to our OGLE3-ULENS-PAR-02 candidate, for different combinations of unknown relative proper motion. The dashed line shows unperturbed motion of the source, while the solid line is the microlensed source position. 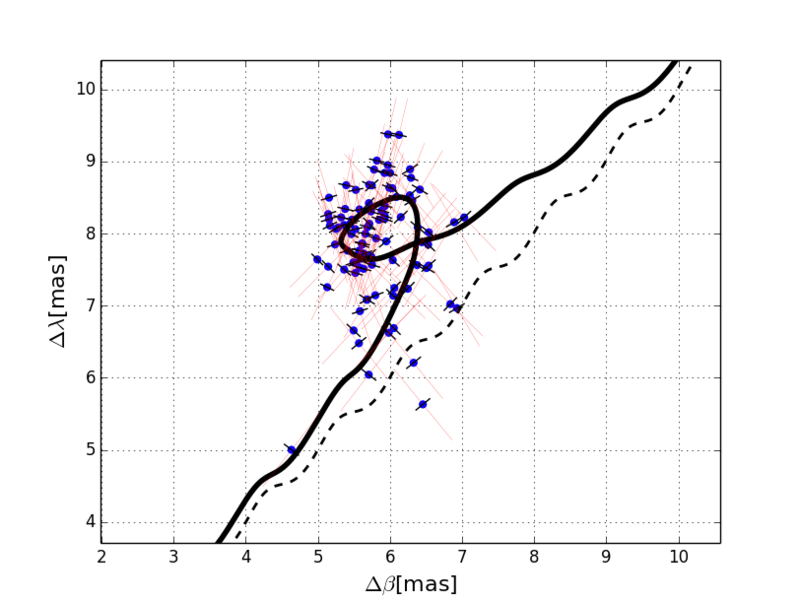 The dots are simulated Gaia measurements, containing both Gaia sampling and expected errors. Note the astrometric errors in one of the directions (Across Scan) are significantly worse than in the other direction (Along Scan). Each plot shows five years of Gaia observations. Any comments about the results, the data and the form of their presentation are welcome. Send your messages to this address.